Successfully Added Bluetooth Folding Keyboard for iPhone, iPad, iPod Touch, Android Smartphones, More to your Shopping Cart. Bluetooth Folding Keyboard: Optimum typing convenience meets portability for your iPad, iPhone, iPod Touch, Android Smartphone, and much more! Typing, chatting and gaming just become easier than ever with this Bluetooth Folding Keyboard. This handy accessory is foldable, which makes it super easy and convenient to carry around. Once folded it fits into almost any bag while being well-protected and resistant to shocks. This Bluetooth Folding Keyboard allows you to enjoy responsive, featherlight typing along with ultra portability and Bluetooth functionality everywhere you go. It includes a full QWERTY keyboard with all the keys you would have with the latest desktop keyboard. This Bluetooth Folding Keyboard even includes a FN (function) key for much more functionality, making everything easier than ever before. 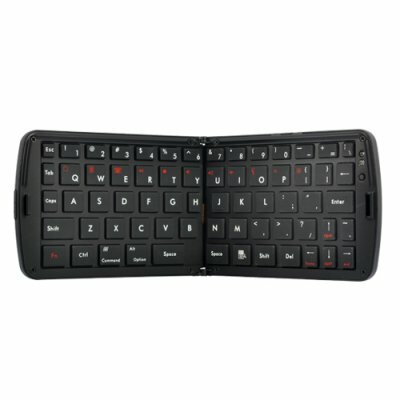 With its Bluetooth 2.0 compatibility, this Bluetooth Folding Keyboard works with most smart mobile systems and the latest consumer electronics, including iPhone OS 4.0+, Nokia Symbian S60+, Windows Mobile 6.0+, Android 2.3+, and Bluetooth enabled Windows/Mac laptops and computers. Setup is quick and easy and in mere seconds your Bluetooth device will be equipped with the ideal tool for texting, writing emails, chatting, web browsing and even gaming! This ultra useful Bluetooth Folding Keyboard turns typing and texting on your mobile phone into a whole new experience. It is in stock right now and brought to you at an unbeatable price by the online leader of electronic goods, Chinavasion.